We’re all about preparedness, right? Well, it’s naïve to think that, if or when you encounter a situation where you need to use your weapon, it’s going to be a clear, sunny day with perfect conditions. It’s also naïve to think we’re always going to feel like we’re in perfect health all the time. Just a note before I get started: if you are unwell, you should keep yourself and others safe, whether that means not carrying (or going to the range) until you feel better, or staying at home, or whatever you need to do. 1. You don’t feel perfect. Maybe you have a stuffy nose, and it’s chilly outside. Do you not carry your CCW when you’re not feeling well? 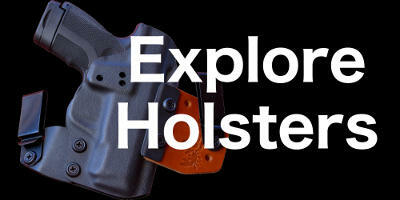 Or do you carry—no matter what? For me, I carry no matter what I feel like—whether that’s a million-bucks or a piece of death-warmed-over. Therefore, it’s just as important to go to the range when I feel the latter as well, to understand how I will react. Now, if how your feeling effects how you safely operation your weapon, don’t carry and don’t go to the range. There’s no need to risk your safety and that of others, but also risk making yourself sicker. 2. The weather’s not great. I’m not talking about a torrential downpour, or a tornado (Clinger Holster’s is located in part of what the nation refers to as “Tornado Alley”). I mean, perhaps a sprinkle or some strange wind. We need to be able to adapt to different situations and conditions. This will make all of us better marksmen, and of course better prepared for the real world. 4. You’re really not in the mood. Maybe your upset, or angry, or maybe you’re just stressed out from a long day at work. Like I’ve said previously, you need to understand how you’re going to feel and how to react no matter what is going on. Further, you need to learn how to push passed those emotions and remain calm and focused. Also, if you’re stressed, going to the range is a good way to relieve some of that. Now, remember: always be safe at the range. As previously stated, if you’re too sick, stay home and get better. When you feel “functional” then try going to the range. However, if you don’t feel like you could safely operate your weapon, stay home and don’t carry until you feel better. Were there any “whens” you think I should add to this list?